The European aviation may be affected for another 48 hours, or perhaps several days, by the ash cloud from the eruption of a volcano in Iceland. The ash cloud is a major threat to aviation, because the floating particles can damage the fuselage of the aircraft and, above all, blocking reactors. Ireland and the UK closed their air space from early yesterday morning. As the hours passed similar measures were taken in Norway, Finland, Sweden, Denmark, Holland, Belgium, northern France and Poland. The closure of German airports aggravates the paralyzation of the European air traffic. Frankfort airfield, the third busiest on the continent, only operates intercontinental flights. There are closed Tegel and Schönefeld in Berlin and as well Hamburg, Düsseldorf, Hanover, Bremen, Münster, Cologne and Leipzig have canceled all flights between 7.00 AM and 14.00 PM today. United Kingdom has extended the closure of its airspace to this afternoon as a precautionary measure, as the heavy gray blanket of ash, located between 5,500 and 11,000 meters, can damage the fuselage of the aircraft and paralyze reactors. All flights to and from the main British airports have been paralyzed as soon until 14.00 PM (CET Spanish). However, some flights from Northern Ireland and the Western Isles of Scotland to and from Glasgow, Edinburgh and Prestwick could be allowed, according to the National Air Traffic Services (NATS). The French authorities have been forced to close 25 airports in the north. Orly and Charles de Gaulle, the main airports of Paris, stopped working at 23.00 PM yesterday. These airports will remain closed until at least 14.00 PM reported by the General Directorate of Civil Aviation (DGAC). Poland has also announced the partial closure of its airspace. The restriction is imposed on the northern sky from 20.00 PM yesterday and until further notice. As for Belgium, the airspace was closed at 16.00 PM yesterday and is not scheduled to open until 18:00 PM today, according to the website of Brussels Airport. And the last countries which have joined the decision to close their airspace have been Estonia, Latvia and Lithuania. In Spain, yesterday have been canceled 497 flights to northern Europe, according to AENA. Among these, 268 correspond to departures from Spanish airports and 229 to arrivals. The cancellations have affected airports in Barajas (Madrid), Palma de Mallorca, Lanzarote, Malaga, Valencia, Alicante and Reus. Most cancellations refer to flights between Spain and the UK, but there were also suspended flights to France, Germany, Norway, Sweden, Finland, Denmark, Holland, Ireland and Belgium. AENA recommends to those who intend to fly in the coming hours to contact their airline (phones for information are: 902 404 704 and (+34) 91 321 10 00). The duration of the airway obstruction in Europe is uncertain. The UK authorities will keep it at least until seven in the morning, but some experts believe that, given the slow pace at which the cloud moves, the problem can take 48 hours or more. 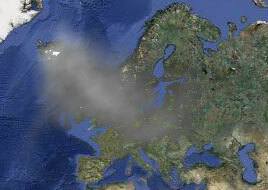 That will depend on three combined factors: the volcano to stop expelling ash, wind direction and speed.